Gefitinib (ZD1839) (INN, /ɡɛˈfɪtᵻnɪb/, trade name Iressa, marketed by AstraZeneca and Teva), is a drug used for certain breast, lung and other cancers. Gefitinib is an EGFR inhibitor, like erlotinib, which interrupts signaling through the epidermal growth factor receptor (EGFR) in target cells. Therefore, it is only effective in cancers with mutated and overactive EGFR. 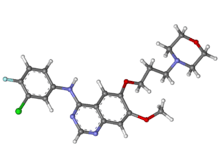 Gefitinib is the first selective inhibitor of epidermal growth factor receptor's (EGFR) tyrosine kinase domain. Thus gefitinib is an EGFR inhibitor. The target protein (EGFR) is a family of receptors which includes Her1(erb-B1), Her2(erb-B2), and Her 3(erb-B3). EGFR is overexpressed in the cells of certain types of human carcinomas - for example in lung and breast cancers. This leads to inappropriate activation of the anti-apoptotic Ras signalling cascade, eventually leading to uncontrolled cell proliferation. Research on gefitinib-sensitive non-small cell lung cancers has shown that a mutation in the EGFR tyrosine kinase domain is responsible for activating anti-apoptotic pathways. These mutations tend to confer increased sensitivity to tyrosine kinase inhibitors such as gefitinib and erlotinib. Of the types of non-small cell lung cancer histologies, adenocarcinoma is the type that most often harbors these mutations. These mutations are more commonly seen in Asians, women, and non-smokers (who also tend to more often have adenocarcinoma). In Europe gefitinib is indicated since 2009 in advanced NSCLC in all lines of treatment for patients harbouring EGFR mutations. This label was granted after gefitinib demonstrated as a first line treatment to significantly improve progression-free survival vs. a platinum doublet regime in patients harbouring such mutations. IPASS has been the first of four phase III trials to have confirmed gefitinib superiority in this patient population. Erlotinib is another EGFR tyrosine kinase inhibitor that has a similar mechanism of action to gefitinib. IPASS (IRESSA Pan-Asia Study) was a randomized, large-scale, double-blinded study which compared Gefitinib vs. carboplatin/ paclitaxel as a first line treatment in advanced NSCLC. IPASS studied 1,217 patients with confirmed adenocarcinoma histology who were former or never smokers. A pre-planned sub-group analyses showed that progression-free survival (PFS) was significantly longer for Gefitinib than chemotherapy in patients with EGFR mutation positive tumours (HR 0.48, 95 per cent CI 0.36 to 0.64, p less than 0.0001), and significantly longer for chemotherapy than Gefitinib in patients with EGFR mutation negative tumours (HR 2.85, 95 per cent CI 2.05 to 3.98, p less than 0.0001). This, in 2009, was the first time a targeted monotherapy has demonstrated significantly longer PFS than doublet chemotherapy. ↑ Sordella R, Bell DW, Haber DA, Settleman J (August 2004). "Gefitinib-sensitizing EGFR mutations in lung cancer activate anti-apoptotic pathways". Science. 305 (5687): 1163–7. doi:10.1126/science.1101637. PMID 15284455. ↑ Lynch, Thomas J.; Bell, Daphne W.; Sordella, Raffaella; Gurubhagavatula, Sarada; Okimoto, Ross A.; Brannigan, Brain W.; Harris, Patricia L.; Haserlat, Sara M.; Supko, Jeffrey G.; Haluska, Frank G.; Louis, David N.; Christiani, David C.; Settleman, Jeff; Haber, Daniel A (May 20, 2004). "Activating Mutations in the Epidermal Growth Factor Receptor Underlying Responsiveness of Non-Small-Cell Lung Cancer to Gefitinib". NEJM. 350 (21): 2129–39. doi:10.1056/nejmoa040938. ↑ Mok TS, Wu YL, Thongprasert S, et al, Gefitinib or carboplatin-paclitaxel in pulmonary adenocarcinoma. N Engl J Med 2009; 361: 947–957. Sebastian M, Schmittel A, Reck, M, First-line treatment of EGFR-mutated nonsmall cell lung cancer: critical review on study methodology, European Respiratory Review. 2014 Mar 1;23(131):92-105. ↑ Mok TS et al. Gefitinib or carboplatin-paclitaxel in pulmonary adenocarcinoma. N Eng J Med 2009; 361. 10.1056/NEJMoa0810699. 1 2 Rossi S, editor. Australian Medicines Handbook 2004. Adelaide: Australian Medicines Handbook; 2004. ISBN 0-9578521-4-2.